The FOX television series America’s Most Wanted featured a story about the unsolved “Zodiac” murders which asked viewers for help in identifying an “unidentified man” who appears in a photograph with victim Darlene Ferrin. The photograph was posted on the Internet on November 5, 2010, by Tom Voigt, a part-time Bigfoot hunter and owner of the website Zodiackiller.com. Voigt wrote that the photograph in question “was apparently taken in 1964 or so and then stored in a box in an attic,” however he was unable to identify the man seen standing with Darlene. Voigt promoted Richard Gaikowski as a viable suspect despite the fact that no credible evidence implicated him in the Zodiac crimes. Every law enforcement agency which had examined the claims by Gaikowski’s accuser Blaine Blaine had dismissed him as a crackpot with no credibility, and the late SFPD Inspector Mike Maloney had reportedly referred to Blaine as “one of the top three Zodiac kooks.” [Read more about Richard Gaikowski and his accuser Blaine Blaine.] On November 7, 2010, Voigt reported: “Just got off the phone with Darlene’s sister. She recognized the man in the photo to be Richard Gaikowski.” Most observers noted that the man in the photograph was not Richard Gaikowski and that Darlene’s sister Pam had a long history of telling tall tales which led police, researchers, and others to conclude that she was not a credible witness. Even Tom Voigt shared this assessment of Pam. In 2000, a member of Voigt’s message board referred to some of the claims made by Pam, and Voigt responded, “The stories you mentioned came from Dee’s sister, Pam, who has severe credibility issues.” For obvious reasons, Voigt failed to mention Pam’s “severe credibility issues” when he publicly declared that she had identified his pet suspect. After Tom Voigt implied that the man seen in the photograph with Darlene Ferrin was possibly Richard Gaikowski or even Zodiac victim Bryan Hartnell, others immediately noted that there was a far more logical explanation– the man resembled Darlene’s ex-husband Jim Phillips. Darlene and Jim married in Reno on January 1, 1966, and the photograph was reportedly taken sometime in 1966 or 1967. The man in the photograph is wearing a ring on the ring finger of his left hand, the appropriate place for a wedding band (Richard Gaikowski and Bryan Hartnell were not married in the late 1960s). According to most reports, Darlene Ferrin was approximately 5 feet 5 inches tall. According to the Vallejo police reports, Jim Phillips was approximately 5 feet 9 inches tall (a report from another law enforcement agency listed him as 5 feet 6 inches tall, however the VPD’s description was also based on their face-to-face meeting with Phillips in 1970). The man in the photograph appears slightly taller than Darlene. An examination of the photograph and a yearbook picture of Phillips shows that the hairline and features of the man in the photograph are very similar to those of Jim Phillips. Tom Voigt continued to suggest that the “unidentified man” in the photograph may have been somehow connected to Darlene’s murder or the Zodiac crimes, yet many members of his own message board agreed with other reasonable observers and believed that the man was most likely Darlene’s ex-husband. The America’s Most Wanted website stated that police wanted to identify the man in question, yet anyone who wished to do so would have better luck contacting Darlene’s family and friends in search of an answer rather than asking viewers all over the world who did not know Darlene Ferrin at all. The AMW broadcast consisted largely of material already shown in previous Zodiac segments and the inclusion of the “unidentified man” seemed to be little more than an attempt to boost ratings with the illusion that the broadcast was presenting important new evidence. The facts strongly indicated that the man in the photograph had no connection to the Zodiac and that those who continued to claim otherwise were doing so in order to get attention. After Voigt’s “Unknown Man” Mystery fizzled, rumors surfaced that Voigt was claiming he had contacted Darlene’s ex-husband Jim Phillips and that he stated that he was not the man in the photograph. In 2008, Voigt had written that Phillips was “is a fabulous source of mine,” yet Voigt did not report any such denials from Phillips to the public. Voigt’s “Unknown Man” publicity stunt had launched a wave of baseless speculation and reignited the already-debunked myths about the life and death of Darlene Ferrin. The bogus mystery was based on the false notion that there was good reason to believe that Darlene Ferrin had been killed by someone she had known. Some observers noted that the man resembled Jim Phillips. In fact, the man in a purported yearbook photograph of Phillips seemed very similar to the “Unknown Man.” I posted an article in which I stated that the theory that the “unknown man” was somehow an important key in solving the case was misleading the public, and, I suggested that the man was most likely Phillips. Many observers agreed with my assessment, yet Voigt and his followers continued to peddle the mystery of the Unknown Man as if identifying this man would somehow propel the investigation and identify the Zodiac. The evidence demonstrated, beyond doubt, that there was no legitimate reason to believe that Darlene had known her killer or that the man in the photograph was somehow connected to her death. Voigt then claimed that Jim Phillips had denied that he was the man in the photograph. Voigt provided no quotes or information to support his claims, and, his history of bogus claims caused many to doubt him. [See the ZodiacKillerFACTS article Tom Voigt, the Good Times Switchboard & Revisionist History] Then, Voigt’s publicity stunt was apparently undone by his own associates– Howard Davis and Sandy Betts. Davis claimed that he had contacted one of Darlene’s friends named Roz, who reportedly stated that the “unknown man” in the photograph with Darlene resembled Darlene’s ex-husband Jim Phillips. Roz advised Davis to check with another one of Darlene’s friends named Barry. Davis then contacted Barry, who reportedly confirmed that Phillips was the man in the photograph. At the same time, Sandy Betts reported that Darlene’s sister Pam had identified the “unknown man” as Jim Phillips. Pam’s identification was puzzling given the fact that Tom Voigt had previously reported that Pam had identified the same “unknown man” as Voigt’s pet suspect Richard Gaikowski. Then, Tom Voigt reported that he, too, had contacted Darlene’s friend Barry, who also confirmed to Voigt that the “unknown man” was actually Jim Phillips. Voigt explained that he was reluctant to accept such identifications without some confirmation, yet he did not hesitate to run to his Facebook page and publically declare: “Just got off the phone with Darlene’s sister. She recognized the man in the photo to be Richard Gaikowski.” Voigt had described Howard Davis and Sandy Betts as excellent researchers, but he was obviously reluctant to end the promotion of the Unknown Man mystery. The available information strongly indicated that the “unknown man” was not unknown at all. In fact, the unidentified man had reportedly been identified by at least three people who knew Darlene Ferrin. Roz, Barry, and Pam all agreed that Phillips resembled the “unknown man,” and, according to Tom Voigt, Pam had also identified the same man as Richard Gaikowski. Voigt himself noted that Pam suffered from “severe credibility issues,” yet no one had presented any evidence or reason to doubt the statements of Roz and Barry. Tom Voigt and others had promoted the mystery of the unknown man by claiming that identifying the man in the photograph was somehow crucial to solving the case. Voigt and others repeatedly suggested that Darlene may have known her killer, may have known Richard Gaikowski, etc., and Sandy Betts had repeatedly claimed that Phillips was somehow involved in Darlene’s murder. All of the theories and propaganda were based on the idea that Darlene had known her killer, yet the evidence indicated otherwise and even Voigt himself had ridiculed such claims. The facts clearly demonstrated that the most logical explanation was that the “unknown man” was actually Darlene’s ex-husband, Jim Phillips aka Jim Crabtree. Decades ago, police had investigated and determined that Jim Phillips was not a suspect and that no evidence existed to indicate that he was involved in Darlene’s murder. No legitimate researcher or investigator had suggested that Phillips could or should be viewed as a suspect. As the mystery of the “unknown man” took hold, discussions seemed focused on one issue: If Phillips was NOT the unknown man, then the mystery remained and identifying the man was of great importance in solving the case. Yet no credible evidence indicated that Darlene had known the killer and, therefore, there was no reason for anyone to “investigate” the individual in the photograph. Jim Phillips was not the issue, and the identity of the “unknown man” was not an important clue which could help solve the Zodiac case. 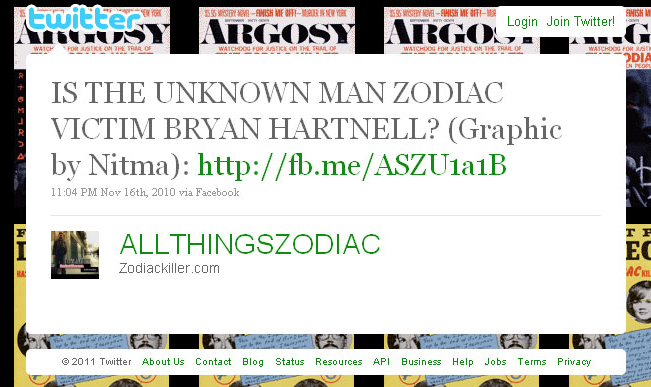 From the very outset, the mystery of the unknown man was promoted as a serious research issue which could help solve the case when, in fact, the entire episode served as a classic example of how the Zodiac tragedy was repeatedly exploited by those who sought attention for themselves.